Downtown Frederick’s largest cemetery is home to over 40,000 gravesites and even more incredible stories. Some of the county’s most famous residents, including Thomas Johnson, Maryland’s first Governor and the famed Barbara Fritchie are honored here. 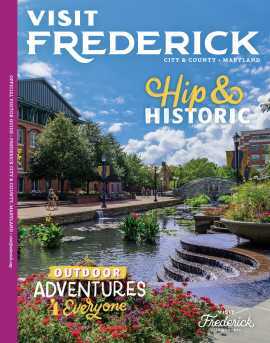 There is no doubt that a visit to this historic site will leave you feeling inspired and eager to learn more about Frederick’s rich past! Perhaps the best known resting place in Mount Olivet is that of Francis Scott Key. Just within the gates of the site stands a monument to the Star-Spangled Banner author. Key penned the lyrics, written as a poem at the time, from aboard a ship during the naval bombardment of Fort McHenry in Baltimore. His monument stands tall as a tribute to his great contribution to our nation. Mount Olivet welcomes visitors to tour the grounds on foot, by bike or by car all year long. Take your time exploring with a self-guided tour or experience a guided historic walking tour of the grounds. Seasonal candlelight tours are a truly unique and fun way to experience the site as a guide leads visitors through the labyrinth of graves by lantern.